St Augustine talks to us again today in A Year with the Church Fathers. He tells us about what people do and what God does in making the human-divine connection. What he says reflects what Thomas Aquinas taught us about the roles of reason and faith. Are we to have blind faith? No, says Thomas. We are to employ all of our reason and intelligence in reaching up to God. But our reason and intelligence (and strength and influence and good works and... the list goes on forever) will not get us there. We ARE to reach up. But our reaching is like a little child holding up his arms for his dad to pick him up. We express our desire for Him when we reach up. We confess our complete inability to reach Him when we reach up. 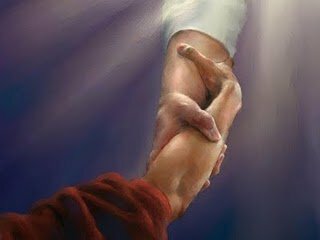 We call to Him to pick us up and take care of us, just by reaching up. That's what prayer is. In a way, that's ALL that prayer is. It's lifting ourselves up and placing ourselves in His presence... so that He can pick us up and brush off our dirt and heal our hurts... like a good parent does for their children. God, we reach up to You. Please pick us up. Thank you again for using your servant Jeff to reach us through his blogs. Through his constant caring and dedication to doing Your will in his life, he is able to touch many souls.